Back in 2012, the Outlander's demand plummeted to an extent where Mitsubishi sold just 1 unit in the month of December. As a result, the model was discontinued. Reasons for this were two-fold: diesel was getting more popular, and the second-gen Outlander was due for a facelift. But that facelift never made it to showrooms as the market was still too sensitive to accept a petrol-powered people carrier. Petrol cars are seeing a bit of a revival now but with a facelift, better safety and mildly improved interiors has Mitsubishi done enough to avoid the same fate? The Mitsubishi Outlander always has an understated look. This time too, it's the same story. It still has a hint of an MPV in the design, owing to the long length, but a relatively narrow bodyshell. To give you some perspective, it is considerably longer than the Jeep Compass but narrower. The face has received a major makeover and looks striking too. The two angular chrome lines lend it some aggression and the protruding grille gives the SUV a sporty stance. It gets LED headlamps and the fog lamps are LED as well. From the side, the Outlander's people-carrying intentions become clear. The large glass behind the B pillars lend the car its length but along with the low roof, make it look a little stretched. Also, the 215/70 R16 wheels on the car look too small for its size, and the alloys could have been at least an inch taller. From the rear the design looks neat and simple, with a good looking set of LED taillamps and reversing lamps set in the bumper. Overall, the Outlander is a very subtle-looking vehicle. It will hardly stand out in any crowd and would suit the taste of someone who desires elegance more than in-your-face looks. Inside, it’s all black. And that's classy. There is also use of faux wooden trims on the dashboard and on the door to add some more sophistication. The centre console and the right AC are both angled towards the driver, making for an ergonomic cabin. The seating position is not that high, but there is tilt-adjustable steering along with electric seat adjusts for the driver to get into a fairly comfortable driving position. Both the seats and the steering are covered in good quality leather and feel premium to the touch. You also get audio and cruise controls on the steering wheels. There is also a two-zone climate control but no AC vents for the second or even the third row. But then you have a look around the cabin and start to spot some niggles. Starting with the blanks. As you would remember, the Outlander is available in just one variant, which means you should get all the bells and whistles. But you don't. You get blanks around the hazard switch and 5 more below the cigar lighter. Also, where you do get a 6.1-inch touchscreen infotainment system paired to a Rockford sound system with 2 tweeter, 4 speakers, 1 woofer and a 710W amplifier (which offer good sound output), you don't get the very basic Bluetooth connectivity. Hence, you can’t even pair your phone. But there is a 12V socket and an USB charger under the centre armrest if you want to keep it charged. The second row offers a good amount of leg and knee room and can be reclined as well. But, with minimum contouring and a flat bench, it is not a rear seat experience the chauffeur-driven might be interested in. And the third row remains a place for kids at best because of the limited legroom and low seat height. The rear seats do get 12V sockets to plug in chargers or other accessories. The 2018 Outlander is being powered by a 2.4-litre petrol engine. Sounds familiar? This is the same unit which powered the last gen Outlander, which came to India as well. But now in the 3rd generation, it makes 167PS of power at 6,000rpm, which is the redline in manual mode, and 222Nm of torque at 4,100rpm. The engine comes mated to a 6-step CVT with a manual mode in which you can use the steering-mounted paddle shifters. The engine runs calmly if you are in the mood for commuting. Be it in the city or the highway, the gearbox handles minor throttle inputs very well. But like most CVTs, this one too suffers from the rubber band effect. Inside the city, even with sudden increase in acceleration for overtakes, the engine will remain fairly relaxed, turning over just under 3,000rpm. At higher speeds though, the engine revs up to 4,500rpm while the CVT builds speeds. This is a little noisy but a fairly quick process, and easy to get used too. The gear changes too take place smoothly. But, if you are looking for sudden acceleration, the delay in speed buildup starts to become more apparent. Floor the throttle and it takes you down to 2nd or 3rd gear, which is quick, but then starts to build speeds.This process is a little faster if you do so in manual mode, but it still won't be exciting to say the least. In out short run, the MID showed an average of around 6.5kkmpl in the city, with the dealerships claiming a figure close to 10kmpl. The Outlander, then, is a very capable commuter. Drive it at constant speeds of 40, 80 or 100kmph and it will cruise calmly. "Tame The City" the ad says - clear intentions. The one thing the Outlander does like an SUV is ride like one. It absorbs small surface undulations very nicely and the vehicle just glides over the bad stuff. It's only the sharpest potholes that are felt in the cabin. This is partially down to the big rubber on the wheels, which keep you well cushioned over the rough patches. The steering feels a little heavy but doesn't offer much feedback from the tyres. The suspension too has been set up on the softer side. The rides do not get bouncy but there is side-to-side movement over the bigger undulations. But that's with most SUVs and nothing out of the ordinary here. In our little stint with the car we could only drive it on the tarmac and the Outlander did impress with its supple ride quality. The all-time 4-wheel-drive system here gets 3 modes: 4WD ECO, 4WD AUTO and 4WD LOCK. There is also a 4x4 low gear for those tough terrains. In ECO mode, power is only sent to the front wheels till the chips figure out that you are on a slippery surface. Auto mode sends some power to the rear wheels as and when required and the lock splits the torque 50:50 between the two axles. The SUV gets an unladen ground clearance of 190mm, which isn't that impressive, and even the approach and departure angles don't seem that impressive either. You also get hill start and stability control and 7 airbags. 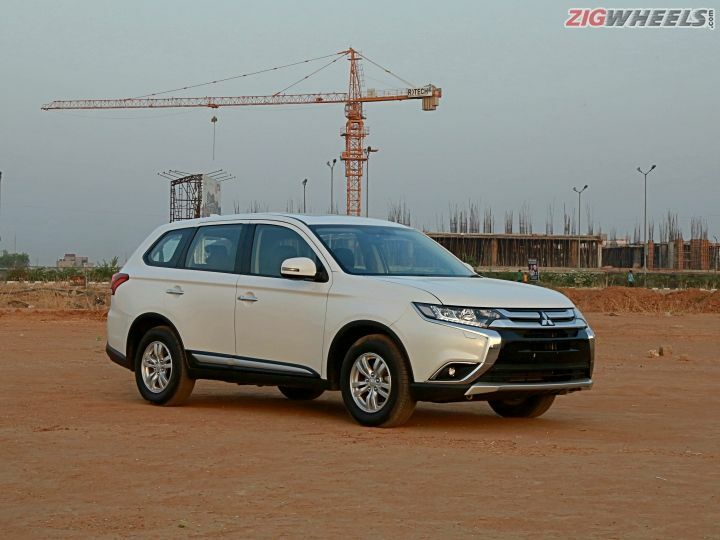 The Outlander then is clearly focused towards city use. And for that, it works well. There is good space for the full family, cargo and more. It even rides comfortable and the engine has impeccable city manners. It doesn't have as big a big road presence as the Kodiaq or the Compass, but it still looks smart and understated. But it lacks on the features front. No rear AC vents and the lack of Bluetooth compatibility are the biggest misses in its arsenal. Its ideal rival is going to be the CR-V when it is launched later this year, but the Honda feels more premium and looks more SUV-ish as well. The only way Mitsubishi has a chance of making the capable Outlander work in the Indian market is by pricing it right. Which brings us to the Achilles heel: The Outlander is going to be a CBU and should be priced close to Rs 31 lakh in India. This means it falls in the price range of other 7-seater proper SUVs like the Endeavour and Fortuner. And when compared to them, the Outlander just might fall short on a lot of other aspects as well.